A cool, nutritious treat to beat the heat. 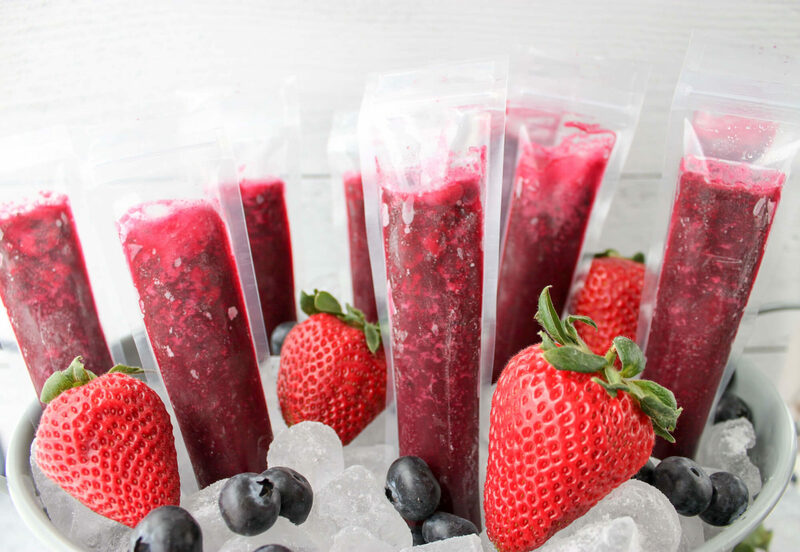 Berry and Beet Ice Pops are kid-friendly, vegan, and gluten-free. No added sugar or dyes! Fresh spring rolls in a bowl! 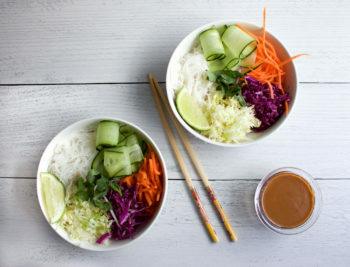 Spring Roll Bowls are light and fresh with similar flavors to traditional fresh spring rolls. 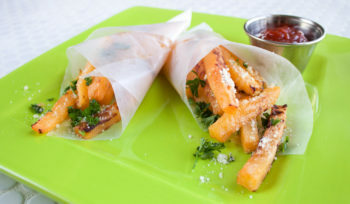 Sweet rutabaga fries topped with garlic and grated parmesan cheese. Kid-friendly and delicious. 10 minutes to prep, 30 minutes to bake. Looking for a salad you can eat at lunch that keeps you full until dinner? 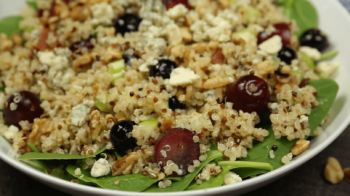 Packed with protein, Ancient Grain Salad with Blueberries will keep hunger at bay and protect you from an afternoon snack attack. Enjoy a warm glass of soothing Sleepytime Golden Milk before bed. 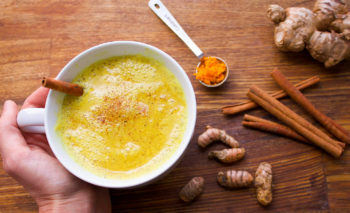 Dairy-free turmeric milk is cozy drink that may help you sleep better. 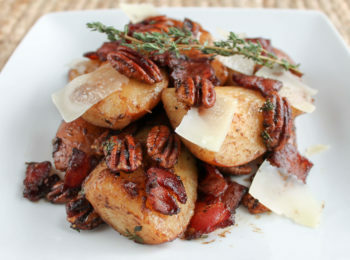 Elegant and decadent, Savory Bosc Pear Salad with Bacon & Toasted Pecans is perfect for special occasions. You might not think of salads as being indulgent, but this one definitely is! 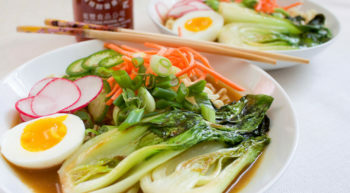 A satisfying Vegetarian Ramen Soup with umami and loads of fresh veggies! Plus, tips on making foolproof soft boiled eggs. 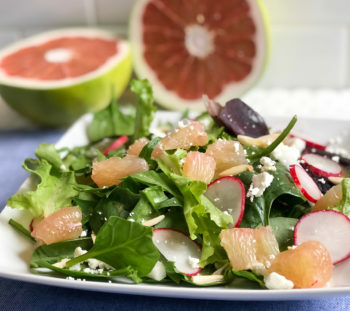 Citrusy sweet, and with a zesty zing this salad with Pummelo, Jicama, and Radish is chock-full of flavors. 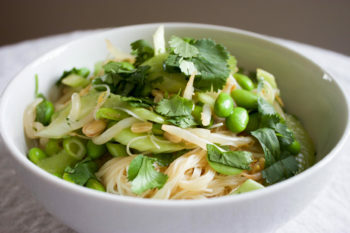 Thai-Lime Edamame & Rice Noodle Salad is quick and easy to make. Vegetarian, gluten-free, and kid-friendly. Serves 4. 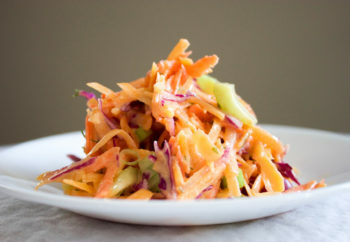 Crunchy Carrot Butternut Slaw is a side dish the whole family can enjoy. It’s bright colors and crunchy textures are enticing, even to kids.